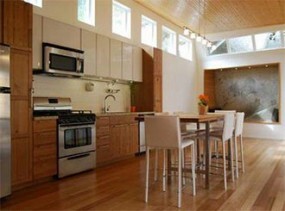 LunarFurniture.com – Speaking of layout in the kitchen, you will soon be familiar with the various names alphabetically. Kitchen layout consists of a form of "U", a form of "L", the form "G", and is the simplest form of "I". Limitations of space at home or in an apartment makes some people had had this kind of kitchen layout. For those who have ample kitchen space, kitchen "I" is rarely an option. In fact, this form can be an attractive option. The first thing is this kitchen has easy access. Although not as efficient as a conventional kitchen "triangle rule", you can quickly reach a variety of culinary purposes. For your convenience, you can also add a small table to put cooking equipment wheels. In this way, your cooking will become easier again. Second, shaped kitchen "I" can save the use of your space. Narrow kitchen can feel more loose. Third, shaped kitchen "I" must also be "friendly" with your budget. With this type of kitchen you just need a kitchen set is smaller, and simpler maintenance. However, you also have to consider several possibilities that will happen with the kitchen in the form "I", for example, little storage space, and a narrow surface. In addition, if there are two or more people cooking together, the kitchen will soon feel full. For that, just make sure you provide adequate lighting. Lighting makes a small kitchen seem more spacious. Especially, make sure the storage space in the kitchen cooking and getting enough light, its function is to prevent your kitchen from rats. You can also use floor tile, granite, or other tiles are easy to clean in the kitchen. Shaped kitchen with "I", chances are you only need one piece mat to keep it clean. Finally, choose a stainless steel surface, especially for a place to wash. Stainless steel tends to be more resistant to the fungus. Do not let your tiny kitchen, which only has a few places to work, contaminated by fungus.